Women love having their nails painted and most of the time, these are very colorful ones. Nowadays, it’s not just colorful but has a variety of designs as well. Looking at their well-manicured nails makes the women happy and confident. Most of the time, they would visit a beauty parlor but if they don’t have much time, they can either have a home service or do it themselves. Many women are willing to spend a lot of money just to have beautifully painted nails. For them, this is their way of pampering themselves after working hard either at home or in the office. Unfortunately though, a nail polish can be hazardous to the health because of the many chemicals that it contains. According to the Pollution Prevention Branch of theCalifornia EPA, a nail polish contains toxic chemicals like toluene, phthalate, dibutyl, and formaldehyde. 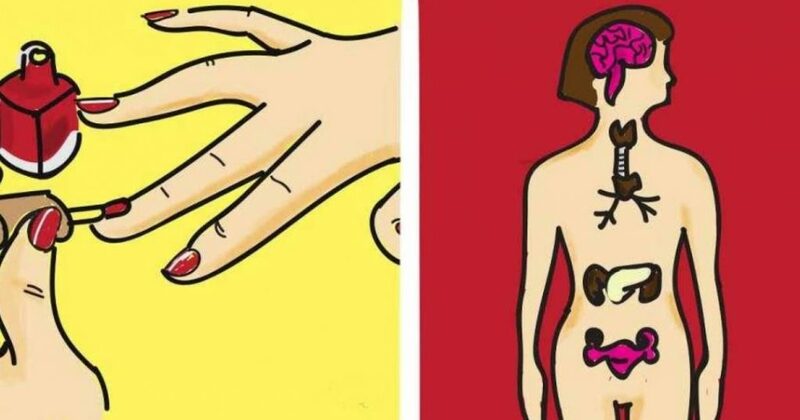 According to Med India, the chemicals in nail polishes can bring health conditions in the reproductive system and worst, it may also cause cancer. They call the three chemicals as the toxic trio. This chemical is used in separating the ingredients in nail polishes and this is also used in gasoline. If you’re often exposed with this, it can be very bad for your health and might affect the nervous and reproductive system. If it’s only used once in a while it can give headache and throat and eye infections. This belongs to a family of chemical compounds that are mostly used in manufacturing PVC. This makes plastic flexible and soft and is also present in cosmetics and most personal care commodities. In many Americans, it is almost always present in the urine. When this chemical enters the body through the skin, it can pose a danger to the reproductive system, kidneys, liver, and lungs. This acts as disinfectant and hardening agent. This is often used to prevent damage on polished nails and make it appear beautiful longer. If this is used frequently, it can cause cancer. According to the Business Insider, this chemical is banned in Europe and some other countries because it can destroy the reproductive organs. This chemical is most dangerous to a woman because it can hinder the chance of getting pregnant. Again, according to Med India, people working in salons especially the manicurists have a great chance of acquiring the diseases that are associated with these chemicals because they are exposed to it almost everyday. Those working in the parlors or salons usually suffer from headache and difficulty in breathing. To avoid the onset of deadly diseases, try looking for those that are less harmful. Check out if doesn’t contain any of the above chemicals. WebMD had given out the list of nail polishes that you can use without worrying that your health would be at risk. Check out for salons that use non-toxic polishes. Make sure too that there is proper ventilation in the salon so you won’t be inhaling all the harmful chemicals inside. These salons may be a bit pricey but if it’ll be safer that way, then there’s no need to think twice in going. If the polish starts to crack, better remove it and allow your nail to breathe for a while. In this way, the nails and even your body won’t be exposed to the harmful chemicals even for a short period of time. This should be practiced to avoid over exposure to the toxic chemicals that are present in almost every nail polish.